This is a VERY UNIQUE recipe for 2 reasons … 1) Because the ingredients depend on what you have left in your fridge and 2) because it uses ANY leftover vegetables or fruits (YES, FRUITS!) to make a delicious, nutritious meal. That’s why it’s called “Clear The Fridge”. The secret is the special SUPER HEALTHY sauce that blends all these fruits and vegetables flavours together. It’s so versatile that even cooked jackfruit (yes, jackfruit!) taste DELICIOUS. Watch the video to see how to make “Clear The Fridge”! 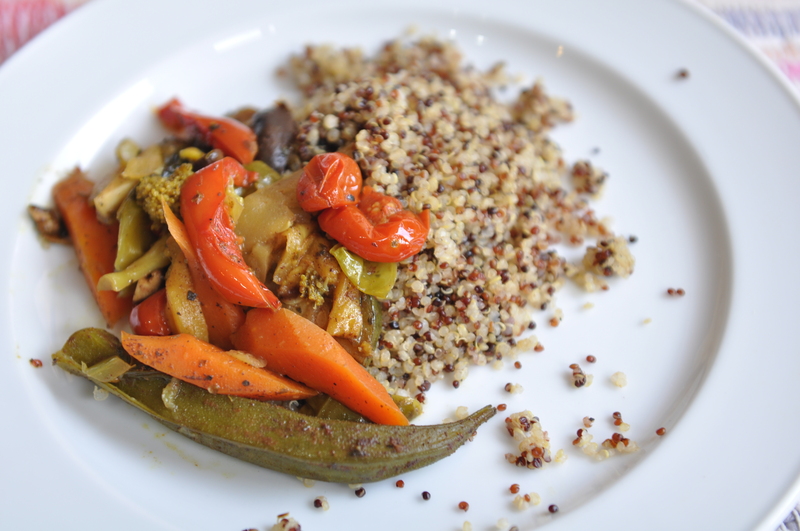 – This recipe goes very well with our Chicken Quinoa Dinner recipe. Check it out! – You can adjust the ingredients in the sauce to your liking. Add more cinnamon Or black pepper Or turmeric OR…anything you WANT… It’s your world! 1) Prepare your vegetables and fruits by slicing them into small bite sized pieces. 2) Place the chopped vegetables and fruit into a baking pan. Set aside. 3) Preheat the oven to 200°. As the oven is heating up, make the special sauce. 4) In a bowl, combine the olive oil, sesame oil, soy sauce and honey. 5) Next, add the cinnamon, turmeric, Italian herbs, black pepper and salt. 6) Mix together and then lighten the sauce by adding the chicken broth or vegetable broth. 7) Pour the mixture over the pan of vegetables. 8) Now the fun part! Put on your gloves (or use your bare hands!!) and mix the ingredients together with the sauce. Make sure EVERYTHING it is properly coated. 9) When the oven has been heated up, cover the top of the pan with a large piece of foil. 10) Pop the tray into the oven and bake for 50 minutes. 11) After 50 minutes, take the pan out of the oven, mix well. grab a spoon and fork. 12) It’s time to ENJOY!! MAKAN!